KUALA LUMPUR: Eco World Development Group Bhd plans to launch property projects with a gross development value (GDV) of about £1.15 billion (RM6.28 billion) in the United Kingdom by the end of this year. Eco World (fundamental: 0.5; valuation: 0.3) chairman Tan Sri Liew Kee Sin said the projects that will be launched are portions of the Embassy Gardens, the Arrowhead Quay and the London City Island. He said all three projects will have different price points to cater to customers with different investment needs. 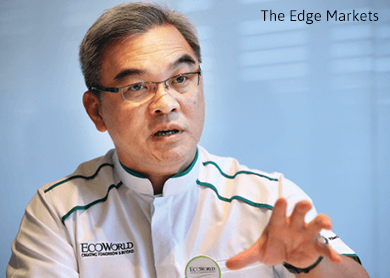 “More than 90% of the units are two-bedroom [ones] with a selling price below the £1 million threshold,” Liew told reporters after officiating the Eco World International Centre at The Gardens North Tower today. The three projects have a combined total GDV of around £2.3 billion, with the GDV for the London City Island at £617 million, Arrowhead Quay at £611 million and Embassy Gardens at £1.029 billion, respectively. Eco World is eyeing a 50:50 mix of local and foreign buyers in the said projects. On the impact of the United Kingdom (UK) general election this year on the property market, former UK prime minister’s trade envoy Lord Jonathan Marland, who was also present at the event yesterday, said it is too early to tell. Nevertheless, he said the UK government has a policy of building 50,000 houses a year in London, regardless of any changes in the political scene. “Currently, demand is definitely more than supply,” he said, adding that the pricing of Eco World projects is deemed affordable to those in the UK. “The UK government is also keen on encouraging more first-time home buyers by offering them lower interest rates for their home loans,” he said. Going forward, Liew said the group will still focus on London and Australia for its overseas property development. “We will consider exploring new markets once the UK and Australian markets are stabilised and the special purpose acquisition company (Spac) is approved by the authority,” he said. 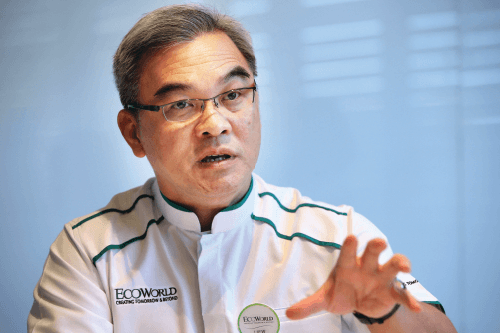 Liew and fellow property magnate Datuk Teow Leong Seng, together with some associates, are seeking to list the first property Spac, Eco World International Bhd, on the Main Market of Bursa Malaysia, to raise some RM1.87 billion. The Spac is currently awaiting approval from the Securities Commission Malaysia on the matter. It was previously reported Eco World plans to acquire a 30% stake in the Spac for RM562.5 million. Eco World closed at RM1.93 yesterday, down one sen or 0.52%, giving it a market capitalisation of RM3.82 billion.